ingredients of injera: An injera is prepared with: wheat, rice flour, corn flour and teff. yeast: In addition an injera contains yeast. If you have an intolerance to yeast, you can get rice or bulgur instead of an injera. The preparation time of rice or bulgur is 15 minutes extra. Bulgur is not gluten-free. gluten: Teff is completely gluten-free. People with celiac disease (gluten intolerance) or gluten sensitivity can safely eat an injera of teff. Do you want to eat entirely gluten-free (and yeast-free) with us? Please feel free to contact us and let us know that one day in advance. Then we make gluten-free (and yeast-free) injeras especially for you. meat and fish: In our meat dishes we use beef, lamb and chicken, but no pork. Our fish dishes contain only tilapia. This is an African freshwater fish. crustaceans and molluscs: Our dishes are free of crustaceans and molluscs. milk (lactose): If you have an intolerance to milk products (lactose), report that us when ordering. We will keep this in mind. soy: Our dishes are free of soy. nuts, peanuts, sesam seeds and lupin: We do not use nuts (such as almonds, hazelnuts, walnuts, cashews, pecans, Brazil nuts, pistachios and macadamia nuts), peanuts, sesame seeds and lupin in our meals. celery and mustard: Our dishes are free of celery. Mustard we only use in green lentils. If you have an intolerance to mustard, tell us when ordering. We will keep this in mind. eggs: Some dishes contain a boiled egg. If you don’t want an egg, report that us when ordering. We will keep this in mind. additives: Our dishes are free of additives. These are flavourings, aromatic substances, colourings and preservatives. So we don’t use E621. This is ve-tsin, or monosodium glutamate (MSG). sulphite: We do not use sulphite in our meals. Wine does contain sulphite. fresh: The meals at Addis Ababa are prepared fresh every day. So they retain their natural and fresh taste and you can enjoy your meal to your heart’s content. herbs and spices: All Ethiopian and African herbs and spices that we use, are fresh and are put together with a lot of care. 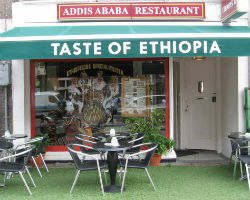 In short: Restaurant Addis Ababa is hospitable to fish lovers, meat eaters, vegetarians, vegans and people with a food intolerance. 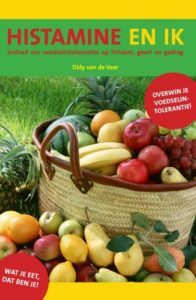 In the book Histamine en ik, Invloed van voedselintoleranties op lichaam, geest en gedrag van Didy van de Veer (Histamine and I, Influence of food intolerances on body, mind and behavior) by Didy van de Veer, you will find interesting information about the effects of allergens in nutrition.